Chicago is otherwise called as “Windy City” lies along Michigan Lake’s shores. It is the popular city for cultural attractions, architecture, shopping, colorful art scene, and beaches. The wind city is the state’s largest and the country’s third most populous city. Over three million people live in this beautiful city. The great architects such as Frank Lloyd Wright, Louis Sullivan, the world famous artists Picasso, Chagall, MirÃµ, and Dubuffet had left their marks in the form of art and architecture in Chicago. The outstanding sports groups such as the Chicago White Sox, the Chicago Bulls in basketball, the Chicago Bears in American football and Cubs in baseball hail from the Chicago city. You need not raise your eyebrows for the city is being the biggest tourist destination. It houses many museums, parks, zoo, aquarium, planetarium, restaurants etc. The Willis Tower’s former name was Sears Tower. The tower’s construction was completed in 1973. It was the tallest building then in the world. The Willis tower has 108 stories and Willis tower height is 1450 feet above the city. The world popular sky deck is on the 103rd floor of the tower. Every year 1.3 million tourists visit here. The Willis Tower has been a dwelling for large companies. Besides being an official building, it is a landmark for culture and iconic tourist attraction. Millennium Park is an absolute green space. It is containing 25 acres of landscape, defined architecture and a massive collection of public art. 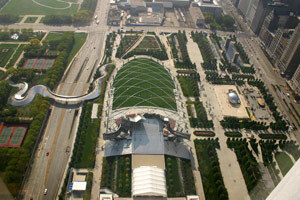 In 2014, Millennium Park celebrated its 10th anniversary. It continuously presents free events, programs. They are films screenings, art installation, outdoor millennium park concerts etc. The stunning Jay Pritzker Pavilion is classy outdoor concert venue. The world’s renowned living architect legend Frank Gehry designed it. The Magnificent Mile covers the 13-block stretch of North Michigan Avenue. It is being an impressive showcase for entertainment, style and fun. Over 460 stores, 60 hotels, 275 restaurants, unique entertainments are the prime features of the magnificent mile. John Hancock Center, Tribune Tower, and the Wrigley Building are some of the giant attractions here. Navy Pier is the most popular tourist attraction here. It was opened in 1916. The place was a shopping and an amusement park in the inception. But, now every tourist wants to visit the place. 50 acres of Gardens, shops, concert venues, parks are here. Navy Pier Park encompasses a 150 ft Ferris wheel and carousel. Tourists can enjoy watching films in the 3D Navy pier Imax Theatre. Actors performance in the Shakespeare Theater. Walkout in Crystal gardens and indoor botanical garden. Navy Pier children’s museum attracts many kids even adults. August festival has a great celebration at Navy Pier. Various sightseeing places are enjoyed from the cruise ships that start from here. Its gorgeous architecture makes the tourists stroll along the Chicago Riverwalk. The continuous walkway makes them to reach bars, restaurants, urban attractions. Many popular river cruises and water taxis are there in Chicago River. Most of the cruises either start from Navy Pier or Michigan Avenue Bridge.